A left ventricular assist device (LVAD) is a mechanical pump that is implanted in patients with heart failure. It helps the bottom left chamber of your heart (left ventricle) pump blood out of the ventricle to the aorta and the rest of your body. That is why it is called a Left Ventricular Assist Device. Abbott and HeartMate IIl™ are trademarks of Abbott. And/or Reproduced with permission of Abbott, ©2018. All rights reserved. Does an LVAD take the place of your heart? No. A left ventricular assist device does not replace the heart. The LVAD receives blood from the left ventricle and delivers it to the aorta. It pumps along with the patient’s own heart. This helps the left ventricle pump blood. How does the LVAD work? There are a few different LVADs available at Cleveland Clinic. The doctor will recommend the one that is best for you based on your needs and medical condition. The pump unit is placed in the chest. It is implanted by the surgeon into the apex of the heart where it receives blood. A tube then delivers this blood from the device to the aorta (the large artery that takes blood from the heart to the rest of the body. It works by pumping blood by continuous flow from the left ventricle to the aorta. The pump is attached to a driveline (cable) and control system (controller). The driveline passes from the device through the skin on your belly (abdomen) to the controller (a small computer) on the outside of your body. The controller runs the pump and provides messages and alarms to help you operate the system. A power supply (rechargeable batteries or cord that plugs into an electrical socket) keeps the LVAD running. The LVAD can be used two ways: bridge-to-transplant and destination therapy. 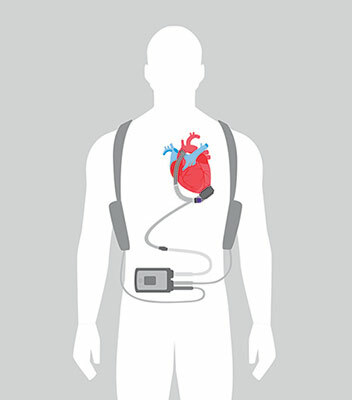 In 2008, the FDA approved the LVAD device for patients awaiting heart transplant. As patients wait for their transplantation, their heart and medical condition may continue to worsen which may lead to hospital admission, increased symptoms and damage to other organs such as the kidneys, liver and lungs. If a patient is a candidate for a heart transplant, bridge-to-transplant therapy helps the patient survive until a donor heart becomesis available. The LVAD assists the heart and allows the patient to have better quality of life and fewer symptoms; and is then removed at the time of transplant. The amount of time you receive support from a VAD until heart transplantation varies and depends on your medical condition, blood type, and body size. Currently, the Heartmate III, HVAD and Heartmate II are FDA approved for BTT. In 2010, the FDA approved the LVAD device for patients as destination therapy (DT) for patients with heart failure who were not candidates for heart transplant surgery. It is considered only for patients when all other treatment options, such as medications, lifestyle changes and heart procedures, have been tried and not effectively managed heart failure. The goal of DT is to support the patient’s heart function and improve quality of life for the rest of the patient’s life. Your doctor will determine if destination therapy is an appropriate treatment option for you, based on your medical condition, symptoms, body size and presence of other medical conditions. Destination therapy may not be the appropriate treatment choice for some patients who have blood clotting disorders, irreversible kidney failure, severe liver disease, severe lung disease, or infections that cannot be treated with antibiotics. Currently, Heartmate III, HVAD and Heartmate II are FDA approved for DT. For more than two decades, surgeons in the Kaufman Center for Heart Failure at Cleveland Clinic have successfully utilized ventricular assist devices (VADs) as a bridge- to-transplant for patients awaiting heart transplantation. Cleveland Clinic has one of the most experienced VAD programs in the United States. The Cleveland Clinic has access to FDA- approved ventricular assist devices, as well as new investigational devices. The Kaufman Center is approved by the Centers for Medicare and Medicaid Services and the FDA to offer destination therapy. Cleveland Clinic is an approved site for disease- specific care for ventricular assist devices as of December 29, 2008. Doctors vary in quality due to differences in training, skill and experience; hospitals differ in the number of services available. The more complex your medical problem, the greater these differences in quality become and the more they matter. Clearly, the doctor and hospital that you choose for complex, specialized medical care will have a direct impact on how well you do. To help you make this choice, please review our Miller Family Heart and Vascular Institute Heart Failure and Transplant Outcomes.